We’ve done 11 workshops all around the country (with 2 to go) since the Ambition document was launched for consultation on 23 March 2016. The team’s heard feedback directly from around 200 people so far - including library staff, decision makers like councillors, commissioners and heads of services, library suppliers, partners, and also (really importantly) library users. We’ve also had well over 100 responses to our online questionnaire plus other sets of comments sent in to us on email or by letter. So what’s the feedback that’s starting to emerge from this consultation? What do people think of the Ambition document and what it says? Besides the handful of guest blogs we have published (and there will be more over the next couple of weeks), we thought we’d share our reflections too. This post looks at some of the comments we’ve received on the context, vision and purposes; we’ll follow up with further thoughts on the sections covering how we can make the Ambition happen and new ways of working. In general, people are telling us that we’ve explained the context clearly. However, they’ve asked us to ensure that this section adequately reflects the reality of what’s happening on the ground. In particular, they want us to draw out more the impact of public sector austerity on local authority library funding decisions, and what providing a ‘comprehensive and efficient’ library service means in those circumstances. There are also a few areas people have asked us to expand on. In particular, they’ve mentioned the importance of libraries’ understanding and meeting community needs, supporting the vulnerable in those communities, providing excellent services for children and early years, and how vital skilled staff are to delivering library services. We set out a number of assumptions (in Annex 1) that we’ve used to draw up the document. One of them was that volunteering would continue to grow. Respondents have challenged us about whether this is a reasonable assumption to make. So we’ll review that statement. Feedback on this has been less clear-cut. There’s been a split between people who think we aren’t being ambitious enough and those who think we’re in danger of being unrealistic in our ambitions given the funding available. They are supporting the idea of continuing to have some nationally consistent offers (currently articulated through the SCL Universal Offers), recognising that this needs to be balanced against local tailoring to meet specific community needs. People have also asked us to include things we hadn’t mentioned in the vision but that they feel are important features of a library service: libraries’ neutrality in providing information and services, the safe and creative spaces they provide to communities, their local service delivery role and the role of local studies. There has also been growing support for including an explicit statement of libraries’ ethics and values to underpin our vision and purposes. We’re now seeking views at workshops on what we should include in this section. In the document, we set out 7 Purposes that libraries support. They are: reading and literacy, digital literacy, health and well-being, economic growth, culture and creativity, communities and learning. People are generally in agreement with these 7 headings as a sensible way of grouping library activity. We’ve had lots of suggestions for additional items that should either be incorporated into one of the existing Purposes (for example, ensuring that local studies is highlighted in the communities section) or included in our vision and values section (eg. accessibility and quality of information delivery). Meanwhile, we are seeking ideas about good outcome-based indicators for each Purpose. We need them both to measure progress in achieving the ambition statements we’ve put into the document, and as ammunition for making compelling cases to future decision-makers about the impact libraries make. Any suggestions or ideas welcomed! The consultation closes on 3 June. You still have time to share your views either by attending a workshop or via the online questionnaire (none of the sections are mandatory, so if you just have views about one or two aspects, you can move through it swiftly). Alternatively, you can email us your comments. Every response is recorded and analysed, and we’ll blog in the future about how we’ve done this and what we have learned (and how we have iterated our approach) as the consultation process has unfolded. To be notified about other posts we publish, including those mentioned above, you can subscribe to our blog via the panel on the right hand side of the screen. Its really important to set out clearly what is actually meant by the 1964 Act's reference to the Sec of State 'superintending, improving, and promoting' the country's public libraries. People need to know what this means in reality so that central government as well as local government can be clearly held to account. There needs to be more consultation on the detail of this. At a time of austerity its easy to duck this issue for fear of the Taskforce being seen to be political but it is critical to challenge the present gap. If it is not addressed properly its like saying we don't need a national strategy on libraries . There will be hundreds of local initiatives up an down the country to make savings in local authority spending and libraries will be overwhelmed (are being overwhelmd) by the need for county councils to meet more clearly specified statutory obligations on social care and education . 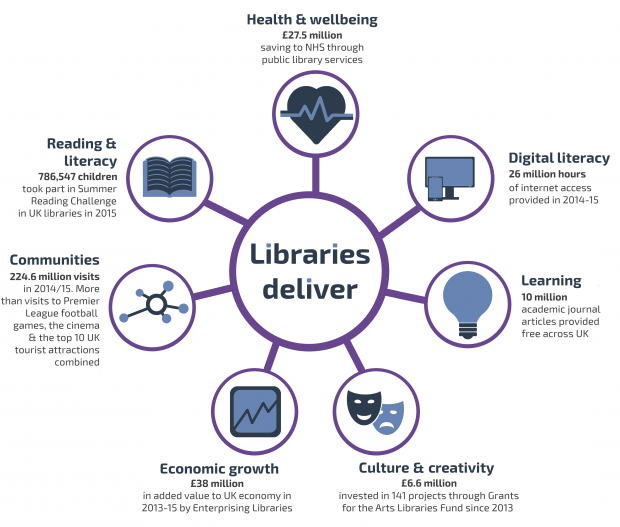 We need national indicators that government funding on libraries can be monitored against and these need to tie up with the added value diagram in the Ambition document some of which link to the NHS and other non local government bodies.